The D5200 most certainly uses the same 24Mpix APS-C CMOS sensor as the D3200 (thus a change from the D5100 which it replaces), placing it right in the middle of entry-level and advanced DSLRs. This new DSLR can shoot in Full HD up to 50i/60i (no progressive scan at 50p) and retains the ergonomic appeal of its predecessor – a 3-inch, 921,000-point articulated screen – and offers some new artistic filters. The Nikon D5200, heir of the D5100, moves into high gear by incorporating the autofocus and exposure measurement of the D7000. A new camera of reference. Apart from the progress that the D5200’s sensor should achieve (the D5100 / D7000’s 16Mpix sensor is excellent), it’s this Nikon’s autofocus that represents a real leap forward. Whereas the D5100 simply reused the D3100’s module, the D5200 adopts instead the efficient and attractive Multi-Cam 4800 DX, the D700’s 39-point autofocus system. The exposure meter receives the same favorable treatment and embeds a 2016Mpix RGB scene recognition sensor, making the D5200 very attractive and even making its new 24Mpix sensor seem like a second-tier improvement. The D5200 retains the 3″ / 921,000-point LMCD Vari-angle screen of the D5100. The Nikon D5200 would have been an entirely up-to-date DSLR had Nikon chosen to endow it with integrated WiFi or GPS sensor (so useful when traveling). For that, however, we have to turn to optional accessories, which are nowhere near as practical as an integrated solution. The D5200 is compatible with the Nikon WU-1a WiFi module which allows for instantaneous sharing of photos and for wireless camera remote control. 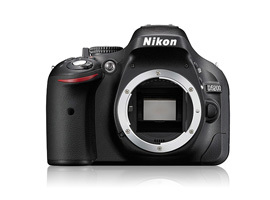 The Nikon D5200 will be available in December 2012 at a price of 879 euros (tax included) with an 18-55mm VR lens.